It’s my pleasure to introduce you to George Marinelli. 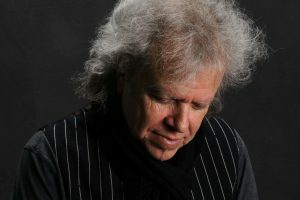 As a founding member of Bruce Hornsby’s GRAMMY-winning band, The Range, George has worked at the highest levels of music for several decades. 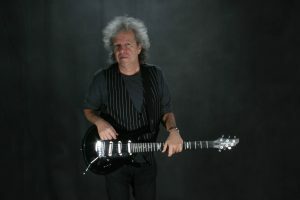 As a long-time member of Bonnie Raitt’s band, George not only tours and performs on Bonnie’s albums but has also collaborated as a songwriter on her last several releases. George’s insights into the subtleties of musicianship apply equally well to the songwriting process. Enjoy! I didn’t take very much away from my high school years academically, but one thing I did pick up was something an English teacher taught us in preparation for an oral report. As a kid, I was extremely shy and the thought of getting up in front of a group scared the living crap out of me, so I took any advice to heart. Something she suggested has served me pretty well, not only as a speaker but as a musician, and it was this: if you don’t have anything to say, don’t say anything. Stop, take a breath, gather your thoughts, then when they are clear, state them. Pretty simple, and very effective. It’s okay to hesitate. What seems like an eternity to you is only a second or two. She literally said to not use phrases like “you know”, “umm”, “er uh”, “uhhhhh” (decades before Beavis and Butthead), and ‘like’ as filler. Now the beauty part for a musician is that this approach to playing makes you phrase in a whole new light. You’ll play memorable parts that aren’t all running together. Less filler, more meat. She taught us that language is for communicating ideas, and the onus is on you, the speaker. You are responsible for making yourself understood, not the listener. Same goes for guitar or any other instrument. If you look at music as another language, the “Universal Language” as it’s often referred to, you can use note choice, phrasing, and sounds to communicate and evoke emotions, which is what all art can and should do. Watch politicians being interviewed, and you can almost see the wheels turning as they figure out what NOT to say. Well, as a session player, I’ve found myself at a loss to come up with something astounding now and then (hard to believe, I know), so I will purposely lay out of a passage. I don’t need to play all the time. It actually makes your parts stand out more if you’re not playing wall to wall. Thanks for bringing this to my attention Cliff. Great content!! Very good article. Well said. Thank you. Love George Marinelli and his work and am in awe of his talent! So proud to have him on 3 of my song recordings where he flavored each one with a different but cooler than cool vibe. Plus he played awesome bass too! Tell George I said, “Hello”. I play with his good buddy Doug Welbaum out here in L.A.
Relevance of your bass work or guitar solo to the particular arrangement is also recommended. As in speaking, or a lyric, relevance to the topic being of strategic importance, playing not merely in tune and on key, but relating to the cadences and melodies in that particular song can make a great difference too. Guitar players often take off on an in-tune/on-key solo that has little relevance to the song they’re accompanying. As in speech, so in music. What do you think is in store for the future of songwriters? Do you think they will be given a good deal with all the streaming units?